Bowflex Max Trainer M5 Review For 2018 – Should You Buy It? Home » Ellipticals » Bowflex Max Trainer M5(Now M6) Review For 2019 – Should You Buy It? When it comes to quality fitness equipment, there are very few brands that beat Bowflex in ease of use, durability, and reliability. This article reviews Bowflex Max Trainer M5(Now M6). It is a revolutionary elliptical which has become quite popular. But is it worth the price? By reading the review, you will be able to determine whether it is suitable for your needs and budget. 2 Why Choose Bowflex Max Trainer M5(M6)? 3.1 Where to Buy Bowflex Max Trainer M5? 3.2 Where to Find Bowflex Max Trainer M5 Coupons? A little history here – the M6 is the modernized version of the M5 and the M8 is the new M7. Bowflex made significant improvements but the price difference is only $100. The M6 and M8 are slightly bigger, more modern, and sexier versions of their originals. The new machines include 21st-century tech including the trademarked Max Intelligence, a USB port, and a safe place for your smart device. Full Body Workout: A lot of people complain about the nature of working offered by treadmills. Most of it is focused on the lower body. The best thing about Max Trainer M5 is that it offers lower as well as upper body workout. So you get the most benefit from your cardio workout. Zero Impact: This is a trademark feature of Max Trainer ellipticals. Zero impact means that you can perform more intense workouts without putting any strain on your joints. Since your body stays in contact with the elliptical during the workout, the risk of injuries is considerably reduced. 8 Workout Programs: There are 8 preset workout programs to choose from. These programs include Max Interval, Calories Burn, Fitness Test, Fat Burn, Smart Max Interval, etc. with all the stats shown on the backlit display. Max Interval and Smart Max Interval are ideal for burning the maximum number of calories. 16 Resistance Levels: 16 resistance levels ensure that there is no plateau when you work out. With Max Trainer M5, you can push your body to the limit and get a more effective workout. The workout is intense and guarantees optimal performance of your body. Having this many resistance levels is beneficial as you will be able to personalize your workouts and control the workout intensity according to your needs. Two User Profiles: Max Trainer M5 has two user profiles which means it allows two people to save their physical data and training stats. Backlit Display: The console of Max Trainer M5 features a gorgeous backlit display. It shows various workout stats and being backlit, it also gives M5 an edge over M3. The display is vivid and clear. You can read your stats easily from all angles. Heart Rate Monitor: On any fitness machine, a heart rate monitor is a crucial feature. Max Trainer M5 has a heart rate monitor embedded in the grips. This wireless monitor measures heart rate accurately and displays it on the console. So you won’t have to spend extra money to purchase a chest strap or other gadgets for heart rate monitoring. 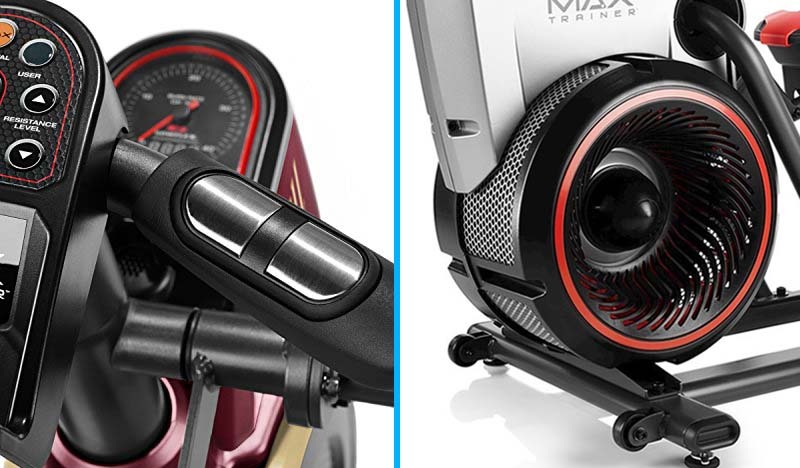 Compact Design: Max Trainer M5 has been designed with space utilization in mind. It has a small footprint and it also weighs less as compared to an average elliptical. So not only can it be easily moved around, but it also takes little space on the floor. 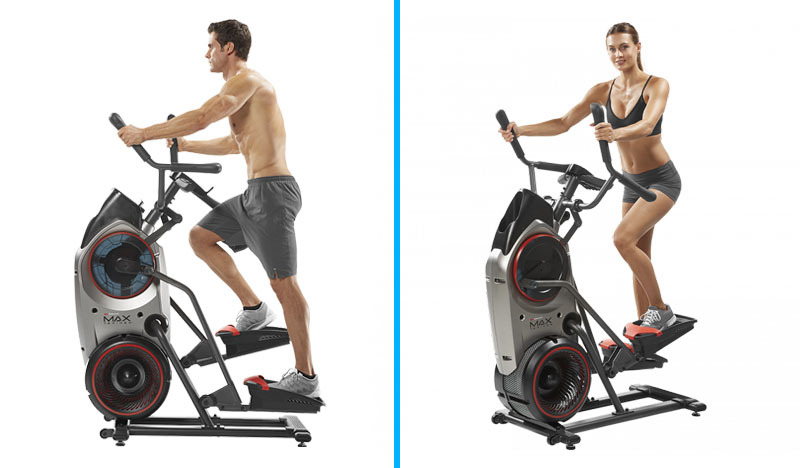 Extra Features: Just like other ellipticals from Bowflex, with M5 you get a wide range of additional features that are aimed at making your entire workout more productive. From large media ledge space (for holding kindle, tablet, smartphone, magazine, etc. ), big foot pads, water bottle holder, to the reinforced rubber grips, all the features of Max Trainer M5 are added to make your workout more effective. Why Choose Bowflex Max Trainer M5(M6)? Treadmills have a bad reputation for putting unnecessary load on ankle and knee joints. Injuries can disrupt your workout progress and also lead to unforeseen expenses. As compared to treadmills and other ellipticals, the Bowflex Max Trainer M5 excels in this area. Since it is zero impact, Max Trainer M5 is highly effective at providing an intense cardio workout with no strains on your joints. So if you struggle with a bad back, shin splints, or joint pain, then this elliptical is just what you need to avoid that while still getting effective workouts. Max Trainer M5 combines the upper body movement with high-intensity interval training applications along with logically stepper design. As a result, you get an elliptical that has all the attributes for intense full body workout. The M5 engages up to 80% more muscles and arms as compared to most other ellipticals. In addition to your legs, you can easily tone your upper body too with this trainer. So you can get the best and the quickest results due to the full body workout. Max Trainer M5 is designed for individuals who want to burn more calories in a very little time. As compared to a regular elliptical, Bowflex Max Trainer M5 offers some amazing benefits. It can burn calories up to 2.5 times faster than an average stair climber, treadmill, or elliptical. You can lose weight twice as fast using it. Through a 14-minute workout, you will get all the benefits of an intense cardio workout. Furthermore, it will also help you increase your stamina and have a stronger heart. After 14-minutes workout, your body will continue burning calories for the next 24-48 hours. So the effects are highly positive. An average refrigerator is 67-inches long and 36-inches wide. An average washing machine, on the other hand, is usually 40-inches long and 27-inches wide. Most treadmills have a large footprint. They are usually 77-inches long and 35-inches wide. Traditional ellipticals are 70-inches long and 29-inches wide. As compared to all these, Bowflex Max Trainer M5 is quite compact as it is only 46-inches long and 25-inches wide. So it is a great choice for individuals who have limited space. Max Trainer M5 is a beautiful piece of equipment. It features an elegant design as its entire body is beautiful silvery. Because of its stunning design, you can easily put it in many places without affecting the theme of your home. In fact, you can place it anywhere to show off when people visit you at your home. Bowflex Max M5 is a quiet machine and has lower noise levels as compared to many other ellipticals available on the market. Where to Buy Bowflex Max Trainer M5? The Official Website Bowflex sells all its products directly from its website. You can expect the most up-to-date pricing if you order the elliptical from the official website. Bowflex also offers a 42-days risk-free trial which allows you to try the product before paying the full price. This service can only be availed via the official website. Availability of the product is another advantage. Since Bowflex is the manufacturer, you will never see ‘out of stock’ notice when ordering the elliptical from their website. Furthermore, Bowflex also offers discounts and coupon codes from time to time so you can enjoy the best possible pricing. You can also rest easy knowing that you will be able to ask for a refund or warranty claim if required and Bowflex will honor it. The only downside of buying from the official website is that Bowflex does not ship to international destinations. Amazon Amazon is one of the largest e-commerce websites in the world. The perks of shopping from Amazon are well known. 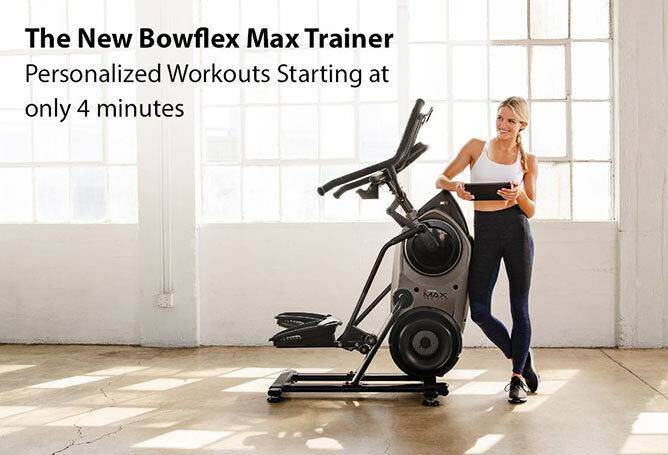 Unlike the official website of Bowflex, you can order Max Trainer M5 from Amazon and expect it to get shipped to any international destination. If you are an Amazon Prime member, then you can expect to see discounted pricing on the elliptical on occasions. The refund policy of Amazon is also reliable. The only problem with Amazon is that since it is highly popular, a lot of people order products from it. As a result, the store is often out of stock. So there is no guarantee that you will find Bowflex Max Trainer M5 on Amazon on a certain date. And unlike Bowflex’s official website, the pricing may not be the most up-to-date and a bit high. Craigslist Craigslist is a popular classified website where you can look for Bowflex Max Trainer M5. While the site offers you an opportunity to find Max Trainer M5 in your local area, you have to really put an effort into the search because finding a specific item on Craigslist can be challenging as you will have to go through different search settings. It can be really time-consuming. The other major concern is the reliability of the product. While you may find Max Trainer M5 on the site that looks great in photos and the price is also good, you cannot know for sure that the actual product is worth the price. In short, buying the elliptical on Craigslist is a huge risk. Where to Find Bowflex Max Trainer M5 Coupons? The only place where you should look for Max Trainer M5 coupons is the official website of Bowflex. Bowflex often offers coupon codes that allow you to reduce product costs, shipping costs, etc. and have the best deal possible. You won’t find any coupons for Max Trainer M5 on other websites. The reason behind this is that Bowflex markets their products in that way. It is a company with a good reputation and excellent quality. It doesn’t ask for inflated prices and then offers coupons and discounts to give customers the feeling that they are making a saving. Instead, it offers the lowest possible prices on their high-quality products. Smooth operation. There is no sudden change in resistance or hiccups. Burn 2.5x more calories than an average stair climber, treadmill, or elliptical. I need a lot of variety in my workouts because I get bored easily. What are the different workout options? Do all the Max Trainer series have the same workouts? There are up to 20 resistance levels and 8 workout programs. Each machine in the series offers a different combination of resistance and programs. The workout program options are Manual, Fitness Test, Stairs, Fat Burn, Calorie Burn, Max 7 Minute Interval, Max 14 Minute Interval, Max 21 Minute Interval, Power Interval, Calorie Goal, Smart Max Interval, and Steady Pace/State. The table below gives the differences in the features. Is the Max Trainer e-friendly? I like to track my progress on my phone. Yes, the M8 and M6 are compatible with the Max Intelligence App, which is much more than just data collection. You get access to Max Trainer videos, customizable workouts, fitness assessments, and rewards! It’s like working out with a friend. The M3 is not connected. In conclusion, Bowflex Max Trainer M5 is an excellent elliptical that is equipped with a lot of useful features that will surely help you achieve your fitness goals in no time. The trainer is very unique and highly effective. It is definitely worth the price if you can afford it.